Le 11 mars 2011, la terre tremble non loin de la région du Tohoku, dans le nord-est du Japon. Le bilan humain est affolant. Ôfunato, préfecture d’Iwate déplore 339 morts, 112 disparus, soit 1,1% de la population totale de cette petite ville portuaire. 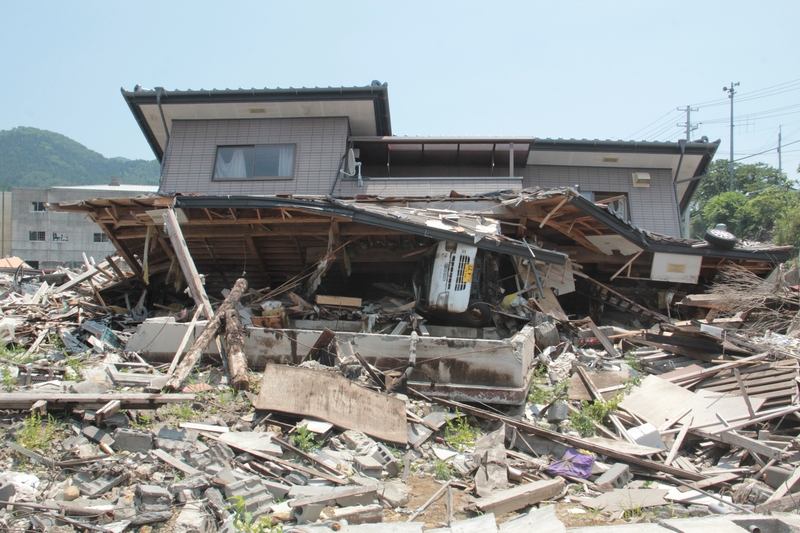 Non loin de là, Rikuzentakata pleure ses 1553 morts et 395 disparus, l’équivalent de 9,2% de la population locale (chiffres datant d’octobre 2011 et fournit par l’organisation indépendante Earthquake Report – http://earthquake-report.com/2011/10/02/japan-tohoku-earthquake-and-tsunami-catdat-41-report-october-2-2011). Les images de vagues déferlantes balayant des villes entières font le tour de la planète. Difficile d’imaginer comment réagir. Mais malgré l’étendu des pertes humaines et matérielles, malgré Fukushima qui menace non loin, les Japonais ne sont pas du genre à se lamenter sur leur sort. Faire le deuil et reconstruire, reconstruire pour faire le deuil, voilà la solution qui s’impose à eux. L’organisation All Hands Volunteers (http://hands.org) ne tergiverse pas et se rend sur place. En mai 2011, elle désigne les villes de Ôfunato et Rikuzentakata comme sa zone d’action. All Hands est là pour aider. Tout ce qui pourra alléger le fardeau des survivants est bon à prendre. Catriona est séduite par le projet. Le Japon lui a donné beaucoup en lui offrant un poste d’assistante d’anglais JET dans une école de la préfecture d’Ibaraki durant deux ans, il est maintenant tant de lui rendre la pareille. Quelques mois après son retour, Catriona témoigne de la situation sur place, de ce qu’elle a vu, de ce qui a été fait et de ce qui reste à faire dans une des zones les plus touchées de l’archipel. Frederic : I heard that you recently went to Japan to help with the effects of the earthquake and the tsunami that followed.. Were you working for an NGO there? Catriona : It is a Volunteer Organisation called All Hands. I think that the first project they ever did was in Thailand. Then, they worked in Indonesia and they had quite a few projects in the US after Hurricane Katrina. And they finally set up a project in Japan at the beginning of May. They came quite quickly after the Tsunami. Before I came here to volunteer I heard that a lot of places were not accepting foreigners onto their programs. They were not even accepting Japanese people from outside the prefecture. I wanted to ask you about the way Japanese authorities may have perceived you. I am sure they were happy to get help, but we also know that sometimes they can be very proud and won’t accept much from the outside. Is Ôfunato close to the epicenter of the catastrophe? Is it a seaside city? Yes it is a port town. So I guess the place suffered lots of casualties? Yes. I cannot give you the exact number, because everybody gave me a different one, but it is at least 300, 400, or maybe more. 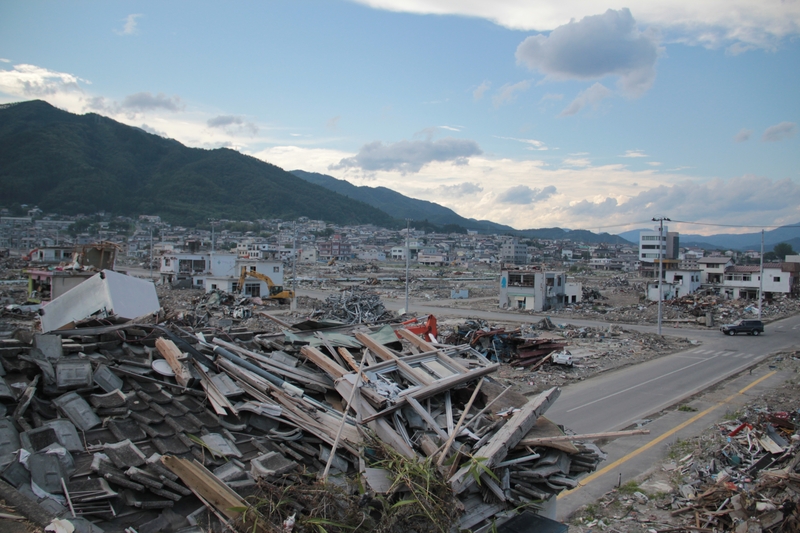 The town next door, which is located a 15 minutes drive away was totally destroyed and thousands of people lost their lives. The name of the town is Rikuzentakata. Did you have the chance to go there, or did you stay exclusively in Ôfunato? 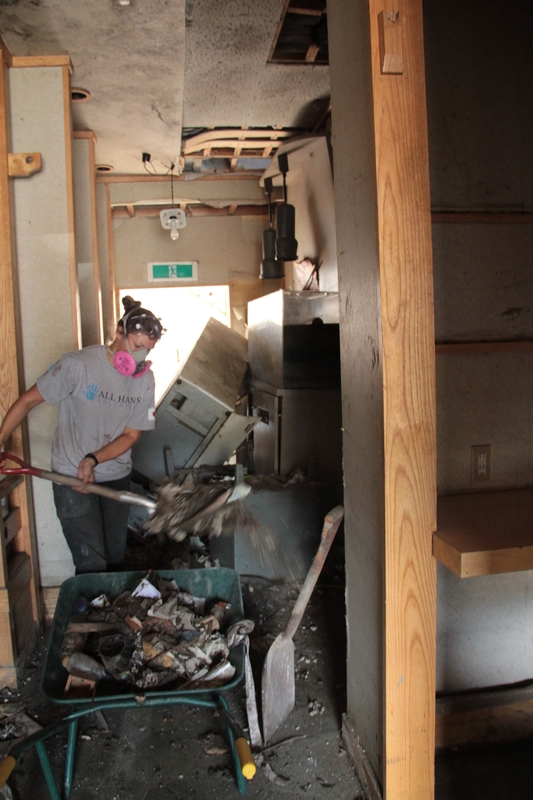 We also did a lot of work in Rikuzentakata. Tell me a bit more about All Hands? Where you only located in Ôfunato? How many foreigners work with the association in Japan? 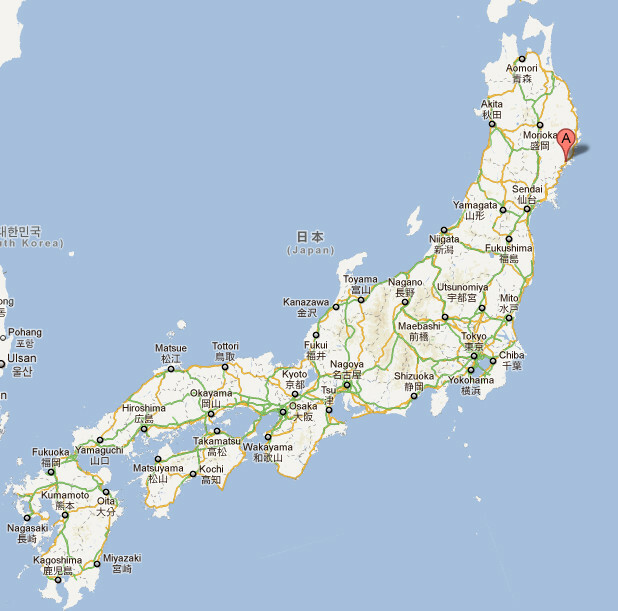 All Hands was based in Ôfunato but also worked in other towns in the local area such as Rikuzentakata and also Yamada, slightly further up the coast. There were many other organizations located in other towns in the area. In Ishinomaki, there was a group called Peace Boat, which I think is actually a Japanese organization, but they had many foreigners working with them also. In Ôfunato, half of the town had been destroyed and half of it was still ok – the old town survived, the part further away from the sea. 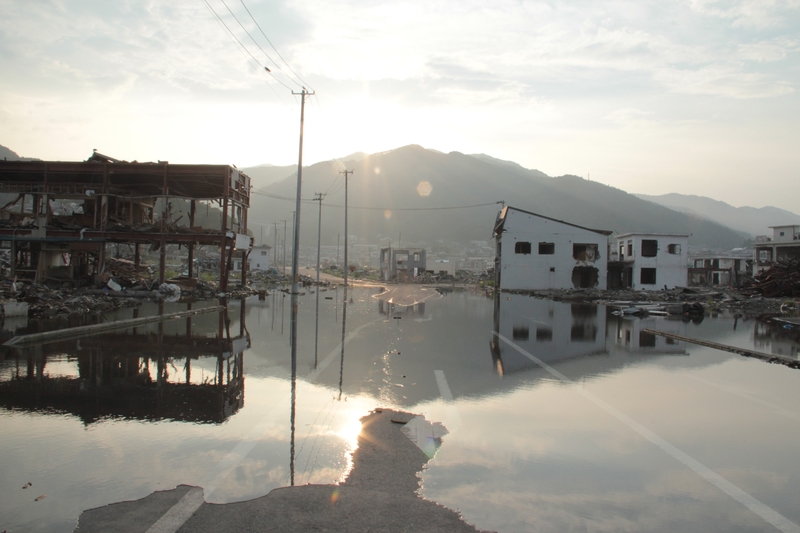 The newest part of the town which was built along the docks was almost completely destroyed. How many volunteers were participating in All Hands activities? During the time that I was there the number of volunteers fluctuated a great deal, especially at the weekend. We had some permanent Japanese volunteers, but it is really hard for them to take time off work so they would often come at the weekend. The organization had a day-off on Tuesday so that it would not stop its activities during the weekend and that way more Japanese volunteers could join us. At the weekend, we would have up to 90 or 100 people. During the week, that would go back down to 60 or 70 maybe. Only foreigners were able to stay during the week days? No, not at all, some Japanese people were there too, but I would say that the majority were foreigners though. During the weekend, it was more 50-50. Have you ever heard of Habitat for Humanity? They would send groups up from Tokyo of 30 or 40 people at a time. They would come and help us out on the weekend. There was also a company called 3M which makes safety equipment. They sent up groups sometimes too. What was your main mission in Ôfunato? Our aim was to help people start the rebuilding process. Before you can rebuild there is a lot of preparation work that must be done and we focused on that first step of getting properties and businesses to a state from which they can be rebuilt. All Hands accept anybody to volunteer. It is first come first served. So compared to other organizations which may ask for specific skills, they were open to anybody who wanted to help. So what we did was to go to houses and remove mud. We would take out the mud under the floor boards. We would also remove rotten walls in people houses and businesses. Alongside the road there are gutters which had been filled with mud. So any time it rained, the road would flood. We removed all the dirt from inside the canals so that the draining could work properly. Basically, it was whatever people would ask us to do. And because we were doing a good job, people started to trust us. How did it work exactly? People from Ôfunato looking for help would just come and knock at your door? They could do that and we would go if we felt like it was something that we could do. Sometimes, when it got too technical, we just did not have the expertise. Did some houses have to be destroyed so that a house could be rebuilt? Some of them were not safe, so yes. A lot of houses had to be destroyed. I worked on a sushi restaurant. It was really sad, because on the street, the building was the only one deemed safe. So even though we were helping someone to rebuild his shop, all the other buildings on either side had to be knocked down. In the end, it was just his shop on this street. He thought it is going to take him at least 3 years to reopen, but the question is, does he really want to? Because if there is nothing else in this area, if nobody else rebuilds, what is the point? What as the state of mind of the inhabitants of Ôfunato at the time? What did they think about the situation? Are they positive about the future? It is a mixture. I think they are worried about the winter. There are still an awful lot of people living in temporary housing. Those people just moved out of evacuation centers one month ago. The only space left for the temporary housing was school playgrounds. Any public places that used to be used by people to have fun have been taken over by temporary housing. And each area is so small, it must be quite upsetting staying there. I had dinner with some people living there, and on the surface, they all tried to be very positive. But I know it is a very Japanese thing to do and that underneath the surface, they may not be all that positive. With the winter coming, it is going to be pretty hard. The winter is particularly cold in this area. I like to think that many people were very much motivated and energized by us being there. Can you often hear Japanese people talking about the radiation or do they keep it to themselves? They don’t talk about it all the time. People are trying to forget about it as much as possible, but I am sure it is always on their minds. It is an important issue for them. I think they talk about it with us, because coming from outside Japan, they want to see our perception of it and hear about the foreign press. I think that the foreign press and especially the Americans have overplayed the radiation issue a great deal. But on the contrary, the Japanese underplayed it. The truth probably lies somewhere in between the two. The newspapers report the level of radiation every day in different areas, and I think people are aware now of what those levels mean, but who knows what is safe in reality. You said that life is going slowly back to normal. What about institutional life? Did the kids go back to school for example? Yes. They are having classes and even Bukatsu (club activities). I think they just try to carry on as normal as possible. But as I said, a lot of temporary housing is located on schools playgrounds. So it is complicated. Some students have to travel to different schools so that they can use the baseball ground for example. For how long are people supposed to stay in the temporary housing? I heard that they are only livable in for two years. They are not design to be lived in for any longer than that. Only time will tell I suppose if people have been able to move out before then. Because when you think about it, you may say that two years sounds like a long time, but six months have already passed, and people have only just been allowed to enter those temporary houses. If they are meant to rebuild their family home or a new place to live, it is going to take a long time and and a lot of money that many people do not have. These people were not necessarily insured against a Tsunami, because it came so much further inland than anyone thought possible. They had a Tsunami with the Chile earthquake in the 90’s, but the markers which show the water levels from that Tsunami were so low in comparison to this most recent tsunami. They were not expecting it. How is the state of mind of people in temporary housings? Are they just thankful to at least have a roof or are they angry at the government for not moving faster? I think they are grateful for what they have. But the government is gradually doing less and less. Where they used to give out food, they are cutting back on that. So it is necessary that other volunteer organizations develop a program there. They have to step in to fill that void. Their businesses and livelihoods have been destroyed, so how are they going to survive? Houses are gone. How are they supposed to rebuild when they have literally nothing? With catastrophes such as this one, the question of who is going to pay always pops up? Usually, insurance companies do not bear the cost. Is the Government going to do something for the people to have their houses built back? Fred – this doesn’t answer the question you asked. Not sure if you changed the question afterwards?? All Hands was only supposed to stay until the end of July. I was only supposed to be there for two weeks, but then they pushed it back to the end of September. The project was due to end on the 11th of July, but by the time I got there, they decided to stay for longer. Does the organization get any money from the Japanese government? If not, where do the funds come from? No, they don’t get anything from the Japanese government. They did a lot of fundraising in Tokyo. They also receive a lot of support from donors world-wide. Can you tell me a bit more about the photo restoration activity? Basically, before I went out there, I saw on the All Hands website the story of a volunteer whose career had been to retouch photos. She does that in New York. She went to Japan just as a volunteer but then she walked into someone’s house and saw some damaged pictures and said that she could restore the photos easily using Photoshop. From this, the idea was born. She got her colleagues involved and professionals she knew in New York. So she basically gathered photos that had been damaged and scanned them, and uploaded them on a cloud server and sent the link to everyone. People would download them from wherever they are and fix them with Photoshop and re-upload them. We would download them in Japan again and if it was good quality, we would print them out and give them back to the people they belonged to. It was quite emotional. I found it quite difficult at times. Sometimes, you just want to help people directly, but you end up sending e-mails the whole day. It’s part of the job, but when you don’t see the immediate impact it sometimes gets frustrating. So when you have the chance to hand back a photo that has been fixed, the feeling is amazing. People can’t say they have their pictures on a hard drive, on a computer or on a DVD. They just lost everything. It’s a hard concept to imagine. And what people go back to find first, is their photos. Working in houses, we would find photos and we would ask owners it they were theirs. Often, they would answer “I don’t know who those people are”, because the photos were washed in from somewhere else. So we would find boxes with many photos and it was very sad because we knew somewhere, someone was desperately looking for them. So as well as the retouching, we also got involved in washing the photos, especially in the town next door, in Rikuzentakata. By the time I left, they had probably hand washed about 70 000 photos. You were trained for that? There was a lady in Ôfunato who was kind enough to teach us, because she had studied document restoration in London. In order to allow people to find their photos, we would put them in an album after they had been cleaned, and then send them to a place where people could come and have a look during the weekend. It is pretty scary to think that people had to look through 70 000 photos to find their own. And it is sad to think that you are waiting for people to come and look for their photos, but they may actually not be alive. Sometimes, people come and they don’t find their own, but they find pictures of friends or people that they recognized. Can you tell me if the Japanese Media are still interested in the situation around the Tsunami area? Yes they are. Especially because it was the 6 months anniversary recently. The international press is also quite heavily present here. We were featured on NPR (National Public Radio) in the States. I was also interviewed for Chinese State television. The Media were especially interested in the photo project. In other towns like Yamada, they would organize a Photo Café where they would take the cleaned photos around to temporary housing, and there was often a media presence there. I think the journalists are welcome, but there is always a risk of the coverage being overdone. People just want to get on with their lives, so it is hard when they are always asked the same questions time and time again. One last question. After the Kobe Earthquake, the first ones to help the local population with hot food and blankets were the Yakuzas. It is a well known fact, which put the government in a bad light, as opposed to the Yakuzas. Have you heard about something similar in the tsunami area? No, to be honest, I haven’t. I guess that maybe after Kobe, the government made sure that if it happened again, they would act quicker. What about power distribution in the area? Do you still experience regular cuts? Yes, but it is not usually noticeable.